Reproductions of old maps of towns and villages in Connecticut, from county atlases published in the late 1800s. Most maps show the family name on each house. Maps for Genealogy: Old maps of Fairfield County towns, reproduced from the Atlas of new York & Vicinity, published in 1867 by Beers, Ellis & Soule. 274 Items. Showing Items 1 thru 50. 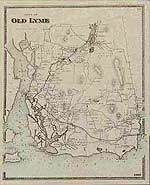 COFA20 1867 Old MAP of Greenwich, Connecticut (CT). COFA21 1867 MAP of villages of Greenwich, Coscob, Mianus, Rocky Neck Point, Glenville, and Banksville, Connecticut (CT); Business Directories for Greenwich, Rocky Neck Point and Coscob. COFA22 1867 Old MAP of Stamford, Connecticut (CT); insets of Long Ridge, High Ridge & North Stamford; Stamford Directory. COFA22A 1867 Old MAP of Stamford, Connecticut (CT) (Plan of Southern Part of the Town of Stamford. COFA24 1867 Old MAP of Darien, Connecticut (CT); insets of Darien village & Darien Depot. COFA25 1867 Old MAP of Norwalk, Connecticut (CT); inset of Winnipauk. COFA27 1867 Old MAP of Westport, Connecticut (CT); inset map of Saugatuck; Saugatuck Directory. COFA28 1867 Old MAP of Westport village, Connecticut (CT); Westport Business Advertising Directory. COFA29 1867 Old MAP of Fairfield, Connecticut (CT). COFA30 1867 MAP of Insets of Black Rock, Greenfield Hill, Southport & Fairfield villages, Connecticut (CT); Southport, Black Rock, Greenfield Hill & Fairfield Business Dirs. COFA31 1867 Old MAP of Bridgeport, Connecticut (CT); Bridgeport Business Advertising Directory. COFA32 1867 Old MAP of Stratford, Connecticut (CT); inset of Stratford village; Stratford Business Advertiser Directory. COFA33 1867 Old MAP of Huntington, Connecticut (CT) (Now Shelton, Connecticut (CT)); Huntington Business Directories. COFA34 1867 Old MAP of Trumbull, Connecticut (CT); inset of Nichol's Farms village; Nichols' Farm & Trumbull Directories. COFA35 1867 Old MAP of Easton, Connecticut (CT); inset of Easton village. COFA36 1867 Old MAP of Weston, Connecticut (CT); insets of Lyons Plains & Valley Forge; Lyons Plains & Valley Forge Business Directories. COFA37 1867 Old MAP of Wilton, Connecticut (CT); inset of Wilton center; Wilton Business Directory. COFA38 1867 Old MAP of New Canaan, Connecticut (CT). COFA39 1867 MAP of Insets of New Canaan & Ridgefield villages, Connecticut (CT); New Canaan & Ridgefield Directories. COFA40 1867 Old MAP of Ridgefield, Connecticut (CT); insets of Titticus & Ridgefield Station; Ridgefield Directory. COFA41 1867 Old MAP of Redding, Connecticut (CT); inset of Georgetown; Redding Business Directory. COFA42 1867 Old MAP of Monroe, Connecticut (CT); insets of Monroe center, Stepney, and Birdseys Plain. COFA43 1867 Old MAP of Newtown, Connecticut (CT); Newtown Business Directory. COFA44 1867 MAPs & business directories for villages of Newtown, Sandy Hook, & Rocky Glen, Connecticut (CT). COFA45 1867 Old MAP of Bethel, Connecticut (CT); inset of Bethel village & Grassy Plain; Bethel Business Directory. COFA46 1867 Old MAP of Danbury, Connecticut (CT); inset of Mill Plain. COFA48 1867 Old MAP of Brookfield, Connecticut (CT); insets of Brookfield & Iron Works villages; Business Directory. COFA49 1867 Old MAP of New Fairfield, Connecticut (CT); inset of New Fairfield centre; Business Directory. COFA50 1867 Old MAP of Sherman, Connecticut (CT); inset of Sherman village with Business Directory. CTHT02 1869 Old MAP of Marlborough, Connecticut (CT); inset of Marlborough Mills; Business References. This historical old Marlborough map is reproduced from the Atlas of Hartord & Tolland Counties, , Connecticut (CT)published in 1869 by Baker & Tilden. CTHT03 1869 Old MAP of Glastenbury, Connecticut (CT) (now spelled Glastonbury). This historical old Glastonbury map is reproduced from the Atlas of Hartord & Tolland Counties, , Connecticut (CT)published in 1869 by Baker & Tilden. CTHT04 1869 Old MAP of Insets of South Glastenbury & Glastenbury Centre, Connecticut (CT) (now spelled Glastonbury); Business References. Reproduced from the Atlas of Hartord & Tolland Counties, , Connecticut (CT)published in 1869 by Baker & Tilden. CTHT05 1869 Old MAP of Manchester, Connecticut (CT); inset of Manchester Green; Business References. This historical old Manchester map is reproduced from the Atlas of Hartord & Tolland Counties, Connecticut (CT), published in 1869 by Baker & Tilden. CTHT06 1869 Old MAP of Insets of Union Village & South Manchester, Connecticut (CT). Reproduced from the Atlas of Hartord & Tolland Counties, Connecticut (CT), published in 1869 by Baker & Tilden. CTHT07 1869 Old MAP of East Hartford, Connecticut (CT). CTHT08 1869 Old MAP of Insets of Hockanum, Burnside & Naubuc, Connecticut (CT). CTHT09 1869 Old MAP of East Hartford Center, Connecticut (CT); insets of East Windsor Hill & South Windsor; Directory. This historical old East Hartford map is reproduced from the Atlas of Hartord & Tolland Counties, Connecticut (CT), published in 1869 by Baker & Tilden. CTHT10 1869 Old MAP of South Windsor, Connecticut (CT). This historical old South Windsor map is reproduced from the Atlas of Hartord & Tolland Counties, Connecticut (CT), published in 1869 by Baker & Tilden. CTHT11 1869 Old MAP of East Windsor, Connecticut (CT). This historical old East Windsor map is reproduced from the Atlas of Hartord & Tolland Counties, Connecticut (CT), published in 1869 by Baker & Tilden. CTHT12 1869 Old MAP of Insets of Ware House Point, Windsorville, Broad Brook, Connecticut (CT); Directories. CTHT13 1869 Old MAP of Enfield, Connecticut (CT); inset of Scitico; Directories. This historical old Enfield map is reproduced from the Atlas of Hartord & Tolland Counties, Connecticut (CT), published in 1869 by Baker & Tilden. CTHT14 1869 Old MAP of Insets of Thompsonville and Enfield Villages; Thompsonville Business Directory. Reproduced from the Atlas of Hartord & Tolland Counties, published in 1869 by Baker & Tilden. CTHT15 1869 Old MAP of Hazardville (Enfield), Connecticut (CT); Business Referenes. This historical old Hazardville map is reproduced from the Atlas of Hartord & Tolland Counties, Connecticut (CT), published in 1869 by Baker & Tilden. CTHT16 1869 Old MAP of Suffield, Connecticut (CT). This historical old Suffield map is reproduced from the Atlas of Hartord & Tolland Counties, Connecticut (CT), published in 1869 by Baker & Tilden. CTHT17 1869 Old MAP of Windsor Locks, Connecticut (CT); insets of Suffield and West Suffield Villages; Dir’s. This historical old Windsor Locks map is reproduced from the Atlas of Hartord & Tolland Counties, Connecticut (CT), published in 1869 by Baker & Tilden. CTHT18 1869 Old MAP of Windsor Locks Village, Connecticut (CT); Business References. CTHT19 1869 Old MAP of Windsor, Connecticut (CT); inset of Rainbow. This historical old Windsor map is reproduced from the Atlas of Hartord & Tolland Counties, Connecticut (CT), published in 1869 by Baker & Tilden. CTHT20 1869 Old MAP of Windsor Centre, Connecticut (CT); Business References. CTHT21 1869 Old MAP of Hartford, Connecticut (CT). This historical old Hartford map is reproduced from the Atlas of Hartord & Tolland Counties, Connecticut (CT), published in 1869 by Baker & Tilden. CTHT26 1869 Old MAP of Wethersfield, Connecticut (CT) (includes present-day town of Newington); inset of Griswoldville. This historical old Wethersfield map is reproduced from the Atlas of Hartord & Tolland Counties, Connecticut (CT), published in 1869 by Baker & Tilden.